This hike offers one of the very best opportunities to see the devastation of the Mt St Helens explosion in comparative fashion. This hike takes you from complete and total devastation to virtual no devastation and then back into almost complete. The trail begins across Forest Road #26 from the Norway Pass Trail head. The trail climbs fairly steep at first and at about a half mile summits. While climbing to this saddle, you are presented with excellent views of the Mt Margaret and Goat Mountain formations. As you walk east of the saddle, you will see Mt Adams peeking over the distant tree covered ridge. The steep cliffy area to your right, on the south side of the trail is a major player in why some of the forest that you will be hiking through survived the 1980 explosion. At about a mile, you can walk off trail for a few hundred feet to view a small little pond. In season, this is a very floral hike. Below you is a nice meadow. Now the trail descends a bit, and enters a small stand of trees that by fate, and a little help from the large cliffy area to the south, survived the explosion of Mt St Helens. This is a very unique area to examine. You will see trees with their tops missing, and beside them, trees with their bark missing. Then next to those trees you will see trees that are completely unharmed. The trail continues to descend and finally crosses the stream from Ghost Lake. The bridge may be out, but the stream is small and not difficult to cross. 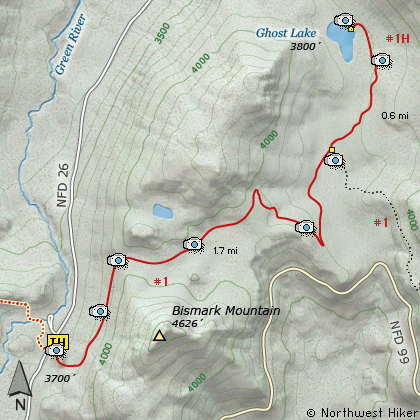 Immediately after the stream is the junction to Ghost Lake and Trail #1H. It is another half mile to trails end along side of the north end of Ghost Lake. As you approach the lake, you will wade through a considerable pile of pumice left over from the 1980 event. All in all, this hike really demonstrates the variety of effects of the devastation. After turning onto Forest Road 99, you will climb westward for about 9 miles before coming to Forest Road 26 on your right, which takes your to the Norway Pass TH, which is also the parking area for the Ghost Lake hike. After you park, you will walk back out to FR99 and you will see the sign for the Boundary Trail 1, which will take for this hike.